It was a late Friday night when I arrived home being exhausted from the terrible traffic caused by undisciplined drivers in the metro highway. I was excited to meet my fiancé along with my surprise weekend getaway planned, however without my knowledge there was most disturbing news that I should know about him regarding on the status of his health. He is working in a famous and reputable Bank; it is a practice and guidelines of the company to conduct annual physical examination to determine if the employees are still fit to work. By him undergoing this physical examination, X-Ray was not good and their Doctor advised him to see Radiologist to seek for a second opinion about the result. He did all of the things and according to the Radiologist based on the X-Ray result from the Company he might have Pulmonary Tuberculosis (can be treated within 6 months of taking medicine) but to be sure, they will perform and test again for diagnosis. So basically, sadness outpouring all over his veins to the unofficial result instead of waiting the official one, he presumed that it is positive already. When he told me about the matter, I got paranoid. I was not able to hug him or comfort him but instead act like very mad and asking why it happens. He don’t smoke, no vice – perfect, where this coming from? After all; I ask myself, where is my support? I actually should be the root of his inspiration, but on that time, I never was. Imagine, immediately he separate all his things because it was advised by the Doctor it is very contagious, and since I was his partner, I should be check as well but I don’t submit myself for checking. I’m still in the process of accepting the fact but I shall allow my intuition to guide me along. I decline to inform him with my surprise weekend getaway due to the news; there is no spirit at all. It was just all of the sudden, we are not talking and doing things separately – it seems were doomed. It was twelve hours – no sleep, no plan, no talking, and no questions – silence. I was thinking, when the result is positive (let us say), he is the breadwinner and supporting his family always, how could he continue doing that when is on leave? All it matters – no answers. Early Sunday on our breakfast, we talked about the situation, planning and how we going life forward with this problem and also agreed to move our wedding date. So we get going, iron out differences and apologizing for our reactions. It’s kind of we accept the situation. This was also the day that he will get the final result from the Radiologist technician and start his medication. I was surprised that he didn’t call me and speak about the result but due to many things happen in between I almost forgot the pressure we are dealing. I always inculcate in my mind that life must goes on – move on forward. When he arrived, one thing I asked was how much is the medicine, he replied there is no medicine for this, so I asked, why, then replied with a smile because I don’t hat Pulmonary Tuberculosis, it was a mistake diagnosis. The X-Ray was clear and it was different compared to the first one. The tension subsides when I heard the good news it’s kind of “let’s call for a celebration”, we have been doomed for many hours but in the end there is no truth about it. We are so happy…smile…smile and laughter. Now, everything is well according to plan and I can’t wait to share my story here because this is how I express my feelings as well. Conclusions are not always pleasant. 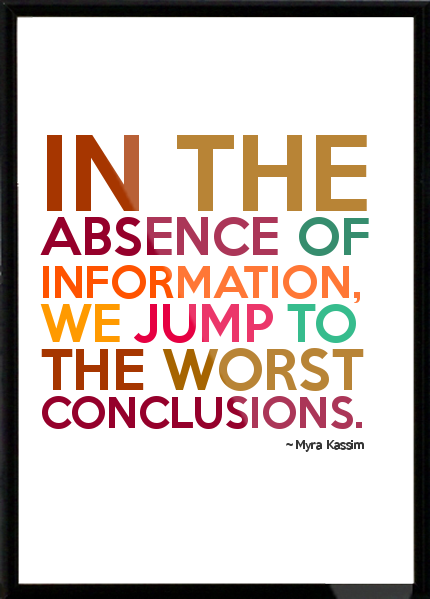 If you follow reason far enough it always leads to conclusions that are contrary to reason. I don’t deny we sometimes draw the right conclusions, but don’t we just as often draw the wrong ones? After all, Life is the art of drawing sufficient conclusions from insufficient premises.